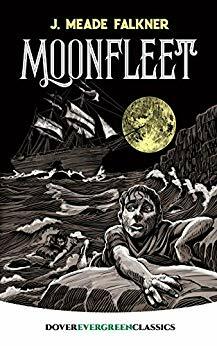 Moonfleet is a classic coming of age story that spans John Trenchard’s life from childhood through adulthood. John is being raised by a cold and critical aunt, while he loves to wander at night dreaming of treasure and contraband runners. When he sneaks out one night to explore a cave-in and passageway under the local graveyard that he has discovered, he doesn’t know that it will change his life forever. Not only does his aunt kick him out of her house for being out at night, but he’s taken in by Elzevir Block, a kind innkeeper who mourns his murdered boy. John find himself loved as a son by this warm-hearted man, but also pulled into a world rife with smuggling and its consequences. When a hateful magistrate schemes to force Elzevir out of his inn, it begins a cascade of events that has Elzevir and John running for their lives. Little does John know that even as they flee, he holds the key to Blackbeard’s treasure and wealth beyond his imagining. Circumstances will align for him to solve the code and discover where Blackbeard hid a fabulous diamond. Will the evil of the treasure follow them and ruin all their hopes? A classic tale of pirates, greed, and consequences in a harsher time. Recommended for those that love historical novels, tales of pirate treasure, and coming of age stories. This rollicking tale of smugglers, hidden treasure, and a wandering ghost casts the same kind of gripping spell as Treasure Island, Kidnapped, and other adventure classics. Set in an English village during the 1750s, it tells of an orphan boy who discovers a dangerous secret down in a church crypt, which results in a series of perilous encounters on land and sea. In the mid-eighteenth century, an epidemic of smuggling sweeps across England’s south coast. The law, enforced by Magistrate Maskew of Moonfleet Manor, is unforgiving. So when young John Trenchard accidentally uncovers illegal activity and gets involved with a smuggling ring, he’s drawn into a life-or-death struggle with the magistrate. Their conflict leads John into an even deeper mystery that climaxes with the search for a pirate’s loot and resolves with the help of loyal friendship and the warmth of romance.